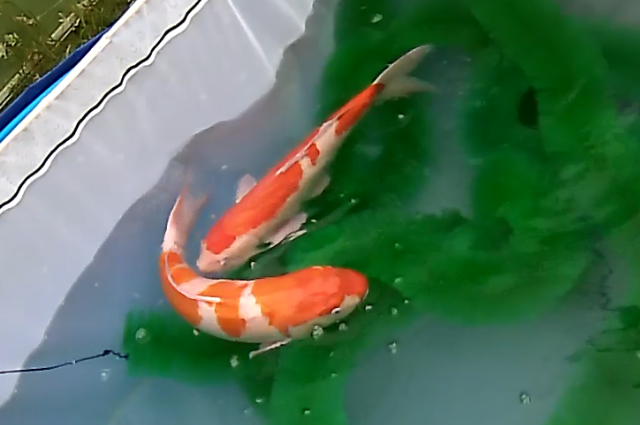 Picked up some more koi to breed from recently. 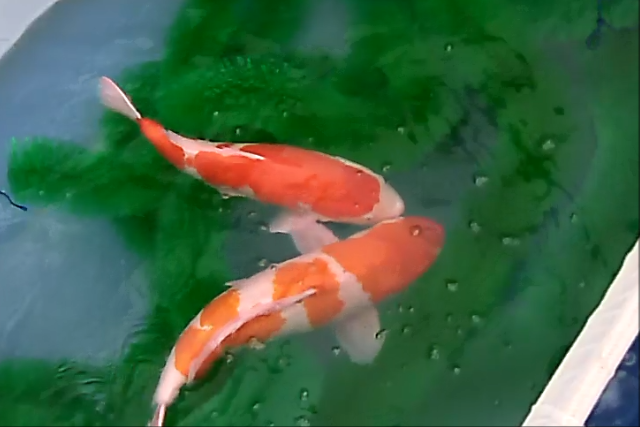 These koi have barely been fed since the end of last summer, and are prospects for next year more than this year. I examined the two females and both have some eggs, and with eggs being in short supply at my place, kicked off a kohaku spawning. They kept me waiting for 2 days, but did spawn. Egg quantity was much lower than you'd expect from a mid 70's cm (4 yr old) female but was actually more than I was expecting when you allow for her feeding regime the last 9 months. She's from Momotaro, and the male (also in the 70's cm) is Matsue. 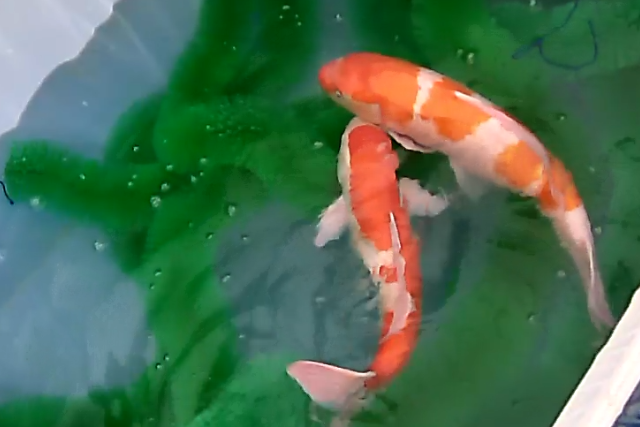 Both from Yume Koi. Here are some pictures from the spawning - taken as snap shots from my IP cam (I think I have mentioned these things are awesome... and once again it came into it's own!). Spawning occured from 4am through to 8am. But, the eggs are a white out. Viable on spawning, but slowly turning white over the subsequent 24 hours. Watching the video, I can see part of the reason for this was the male wasnt always in the right place at the right time when the female laid her eggs. But there are lots of other possible reasons - like fertility and water quality also being likely reasons. The vat smells right. The water looked right after spawning - but it's on my mind that on day 2 I did a 10-20% water change with cool water to help get things going - and perhaps that wasnt properly dechlorinated. Not sure. Having spent a lot of time (and money) on this project, I am maybe operating too fast and need to slow things down a bit. Message to self - more haste less speed. 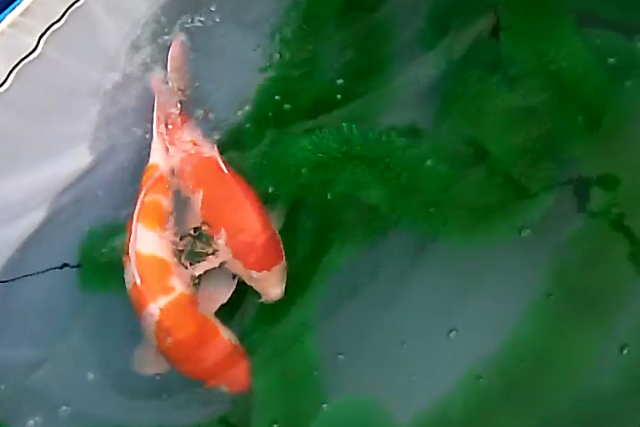 I've a shiro female, and the two showa females left with eggs. The shiro is a new one I picked up from Yume recently and is from a good Omosako line. Mike tells me the body shape is of a good type for a shiro, so I may try her next. 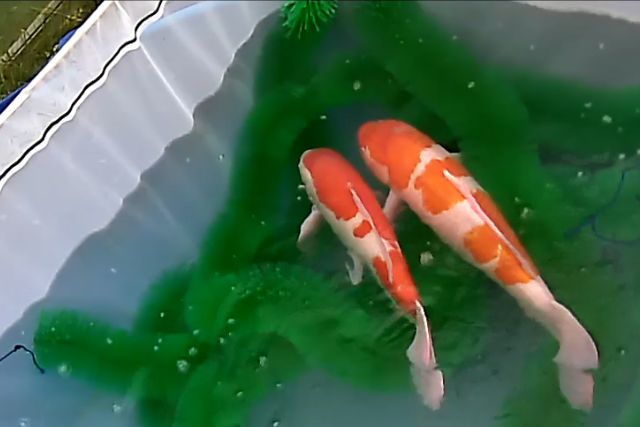 Another option might be the kohaku I spawned in May - she may have developed a new set of eggs so I could try her again. Failing all of that, I've a shusui female but that's my final play. I need to get it right this month......It's my last shot for spawning more fry this year!